As the Ottoman Empire crumbled, leaving Kosovo in a state of anarchy, the Serbian army under King Peter invaded from the north and occupied all of it, much of Macedonia and some of Albania. Hideous massacres, recorded by Leo Trotsky [cf. Trotsky 1912], Leo Freundlich [cf. Freundlich 1913], and Lazër Mjeda [cf. Mjeda 1913], were committed against the Albanian population. Village after village was razed to the ground, with the inhabitants being bayoneted or burned alive. The Conference of Ambassadors, meeting in London from December 1912 to August 1913 to discuss events in the Balkans, confirmed the independence of Albania itself, but agreed to recognize Serb rule over Kosovo, thus excluding 40 percent of the Albanian population in the Balkans from Albania itself. It was a tragic mistake that haunted the Balkans right to the end of the 20th century. The New York Times reported on the ongoing events in its edition of 31 December 1912. Servian Army Left a Trail of Blood. Thousands of men, women, and children massacred in march to sea, say Hungarian reports. Executions a daily sport. Terrible atrocities the result of deliberate policy to exterminate Moslems. Special cable to The New York Times. “On the march through Albania to the sea the Servians did not only treacherously murder and execute armed Albanians, but their beast-like cruelty did not stop at falling upon unarmed and defenseless persons, old men and women, children and infants at the breast. “The Servian officers, intoxicated by their victory, declared that the most effectual pacification of Albania would be the total extermination of the Mohammedan Albanians. This mot d’ordre was quickly adopted by the Servian Army of occupation and put into practice. “Between Kumanova and Uskub [Skopje] some 3,000 persons were done to death. Near Pristina [Prishtina] 5,000, exclusively Arnauts [Albanians], fell beneath the hands of the Serbs, not in honorable fight, but by unjustifiable murder. “To carry out these crimes the maddened soldiers even invented new methods of cruelty to satisfy their lust for blood. In many villages all the houses were set afire, and as the unfortunate inhabitants fled before the flames they were shot in the sight of their wives and children, and afterward the helpless women were forced to watch their children literally carved to pieces with bayonets. “Executions were the daily diversion of the Servian soldiers. In every house in which arms were found all the inhabitants were killed, being shot or hanged. On single days as many as thirty-six executions took place. But the tale of the atrocities which were perpetrated in Albania was by no means exhausted. 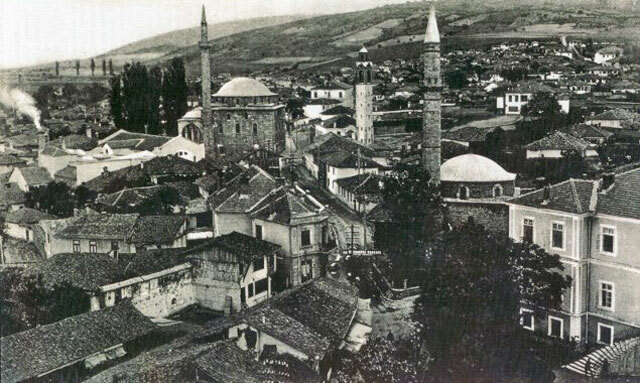 The deeds done in Prilep, Kosovo, Weschitza, it is said, exceed everything which the Albanians had to suffer under Turkish rule. “Whoever denounced an Albanian to the Servians was sure the man would be shot. It happened repeatedly that persons who owed money to Albanian Mohammedans informed on them, designating them as traitors. They were invariably hanged and the debtor was enabled to purchase the house and farm of the victim at an absurdly low price. At Verisovitch [Ferizaj] the Servian Commander invited the fugitives to return and lay down their arms. After they had done this 400 persons were cut down. In the whole of Verisovitch only half a dozen Mohammedan families were left alive. At Pana the Serbs killed their prisoners, while at Varos and Pristina the population was slaughtered. The Servian officers themselves say they hunted out the Albanians, and one officer boasted that he shot down nine Albanians in one day. Even outside the boundaries of Albania the Servian soldiers perpetrated all kinds of atrocities. In the fortress of Nish, where many Turkish prisoners were brought, tragic scenes occurred. A man was trampled to death there for insubordination. “Wherever the Albanians were found they were slain without mercy. Women, children and old men were not spared. I saw villages in flames in old Servia every day.